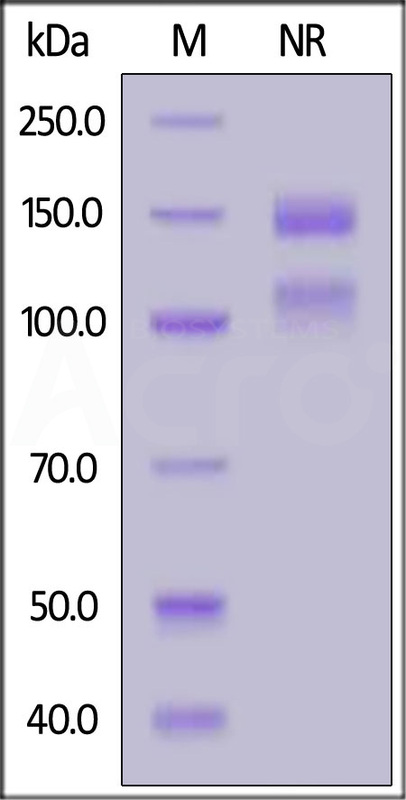 Biotinylated Human ITGA5 & ITGB1 Heterodimer Protein (IT1-H82Wa) is expressed from human 293 cells (HEK293). It contains AA Phe 42 - Tyr 995 (ITGA5) & Gln 21 - Asp 728 (ITGB1) (Accession # P08648-1 (ITGA5) & P05556-1 (ITGB1)). Biotinylated Human ITGA5 & ITGB1 Heterodimer Protein, produced by co-expression of ITGA5 and ITGB1, has a calculated MW of 112.5 kDa (ITGA5) & 83.7 kDa (ITGB1). Subunit ITGA5 is fused with an acidic tail at the C-terminus and followed by a polyhistidine tag and an Avi tag (Avitag™) and subunit ITGB1 contains no tag but a basic tail at the C-terminus. The reducing (R) protein migrates as 120-130KDa (ITGA5) and 100-115 kDa (ITGB1) respectively due to glycosylation. Biotinylated Human ITGA5 & ITGB1 Heterodimer Protein on SDS-PAGE under reducing (R) condition. The gel was stained overnight with Coomassie Blue. The purity of the protein is greater than 90%. 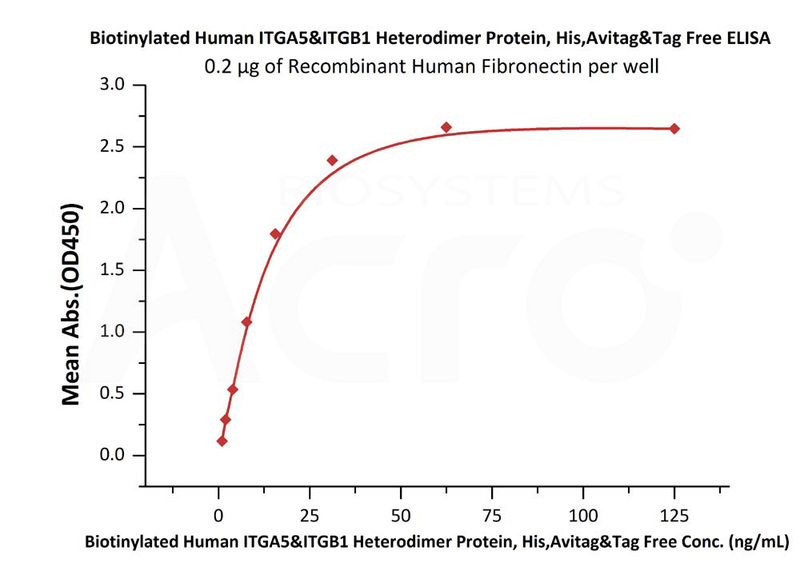 Immobilized Human Fibronectin at 5 μg/mL (100 μL/well) can bind Biotinylated Human ITGA5 & ITGB1 Heterodimer Protein (Cat. No. IT1-H82Wa) with a linear range of 2-78 ng/mL (QC tested). Integrin alpha 5 beta 1 / Integrin α5β1, which is a major cellular receptor for the extracellular matrix protein fibronectin and plays a fundamental role during mammalian development., is composed of α5 (ITGA5/CD49e) and β1 (ITGB1/CD29) subunits. Integrins are adhesion receptors that transmit bidirectional signals across the plasma membrane. The Integrin alpha 5 beta 1 and its primary extracellular matrix ligand fibronectin (Fn) are of great biological importance.